I thank my husband (who is also a Reiki channel) for being my mere source of support and inspiration in enlightening myself and in exploring different Reiki techniques. I thoroughly express my gratitude to him for allowing me to continue my loving practice towards Kuan Yin and Buddha. I love Buddha and Kuan Yin from a very early age. I was merely attracted to both of them without even being aware of the reason behind it. I got the loving reason behind my attraction towards both of them through my Reiki Auto Writing that happened after my Lavender Flame Attunement of Kuan Yin. I got to know that I was practicing Buddhism in past lives, which is making me get attracted towards these ascended masters unknowingly, so that I can be enlightened in this life. I thoroughly thank and express my gratitude to my teacher Charisma Pathak at this juncture again for her lovely guidance in approaching Mother Kuan Yin to establish a connection to get her valuable guidance. The life becomes easy with the grace of Mother Kuan Yin. She forgives us and releases all our sins / karmas, which we have committed in this birth or in our early lives. I am just sharing the list of ways by which everybody can get her grace and always live a life with full of blessings, peace and contentment. Kuan Yin is referred to as the Goddess of Mercy. Her name means “She who observes the Cries of the World”. After earning enlightenment Kuanyin was ready to enter nirvana, when she heard the cries of a single child. Her compassion caused her to turn back, swearing that she would not enter nirvana until every being in the universe was able to be freed of suffering and attain enlightenment alongside her. Kuan Yin is called upon by any who desire mercy or relief. She is also called on by childless women who want to become pregnant. Guanyin grants parents children who are filial and healthy. Guanyin also protects seamen and is the ruler of the Southern Sea. Guan Yin is generally portrayed as a young woman donned in a flowing white robe and usually wearing necklaces symbolic of Indian or Chinese royalty. She is seen sitting on a lotus. In her left hand is a jar containing pure water, and the right hand holds a willow branch. Guan Yin is often depicted by standing alone, standing atop on a dragon, accompanied by a white cockatoo and flanked by two children or two warriors. The two children are her acolytes who came to her when she was meditating at Mount Putuo. The girl is called Longnü and the boy is called Shancai. The two warriors are the historical general Guan Yu from the late Han dynasty and the bodhisattva Skanda, who appears in the Chinese classical novel Fengshen Yanyi. Sometimes she is shown with eleven heads, 1000 hands and eyes on the palms of each hand. The water (the dew of compassion) has the quality of removing suffering, purifying the defilements of our body, speech and mind, and lengthening life. The Lotus Flower blooms on the muddy pond there by signifying that the Mother Kuan Yin will bless all her devotees in achieving worldly desires / attain enlightenment by surpassing all the challenges that comes in. The thousand eyes allow the bodhisattva to see the sufferings of sentient beings, and the thousand hands allow her to reach out to help them. The dragon is an ancient symbol of power, wisdom and transformation. The Dragon is the most highly revered animal out of all others, extremely auspicious and always treated with the highest sense of veneration. The Dragon is regarded as the strongest symbol of good fortune because the Dragon is believed to emit a special form of chi, known as“Sheng Chi” or “Celestial Breath”. It is this Sheng Chi that attracts wealth luck, good fortune, good luck, abundance and success. Thus, the dragon is such a popular lucky symbol that wards off negativity and bestows the people with enhanced business success and prosperity. 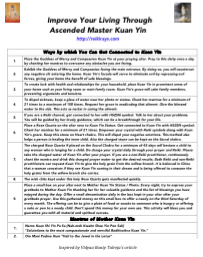 These are some of the ways by which you can get connected to Kuan Yin and get immense benefits in improving your life financially, physically, emotionally and spiritually. Place the Goddess of Mercy and Compassion Kuan Yin at your praying altar. Pray to this deity once a day by chanting her mantras to overcome any obstacles you are facing. Exhibit the Goddess of Mercy and Compassion facing the main entrance. By doing so, you will counteract any negative chi entering the home. Kuan Yin’s facade will serve to eliminate evil by repressing evil forces, giving your home the benefit of safe blessings. To create luck with health and relationships for your household, place Kuan Yin in prominent areas of your home such as your living room or main family room. Kuan Yin’s grace will calm family members, preventing arguments and tensions. To dispel sickness, keep a glass of water near her photo or statue. Chant her mantras for a minimum of 21 times to a maximum of 108 times. Request her grace in eradicating that ailment. Give the blessed water to the sick. This acts as nectar in curing the ailment. If you are a Reiki channel, get connected to her with HSZSN symbol. Talk to her about your problems. You will be guided by her lovely guidance, which can be a breakthrough for your life. Place a Rose Quartz on the altar near to Kuan Yin Statue. Get connected to Kuan Yin with HSZSN symbol. Chant her mantras for a minimum of 21 times. Empower your crystal with Reiki symbols along with Kuan Yin’s grace. Keep this stone on Heart chakra. This will dispel your negative emotions. This method also helps a person in healing the inner child. Also the charged stone can be kept on the Sacral chakra. The charged Rose Quartz if placed on the Sacral Chakra for a minimum of 45 days will bestow a child to any woman who is longing for a child. Do charge your crystal daily through your prayer and Reiki. Please take the charged water of Kuan Yin after your prayer. If you are a non-Reiki practitioner, continuously chant the mantra and drink this charged prayer water to get the desired results. Both Reiki and non-Reiki practitioners can request Kuan Yin to give the holy grain from the willow branch. It is believed in China that a woman conceives if they see Kuan Yin coming in their dream and is being offered to consume the holy grains from the willow branch she carries. The wish chits kept under this holy Rose Quartz gets manifested quickly. Place a small box on your altar next to Mother Kuan Yin Statue / Photo. Every night, try to express your gratitude to Mother Kuan Yin thanking her for her valuable guidance and the list of blessings you have enjoyed during the day. Offer a small denomination daily in the box kept in your altar after your gratitude prayer. Use this gathered money on this small box to offer a needy on the third Saturday of every month. The offering can be to give a plate of food or snacks to someone who is hungry or offering a note or pen to a needy child. Don’t spend this money for your own use. This activity will bless you and guarantee you with all material and spiritual success. I wish all of you to get connected to Kuan Yin to get material success and spiritual success. Happy Practicing by connecting to Mother Kuan Yin!!! Vidyaa studied Psychology and she is a spiritual practitioner who practices different healing modalities to bring meaning to her life and to others. She was drawn to spirituality right from her childhood. However, she was introduced to Reiki in 2011 by her aunt and Reiki became an integral part of her life from then on. Vidyaa is a Reiki Level II Practitioner, Karuna Reiki Practitioner and Tera Mai Seichem Reiki Level I Practitioner. She practices and does healing for self and others by combining techniques using Traditional (Usui) Reiki, Tera Mai Reiki, Karuna Reiki, Crystal Therapy and Mantra Therapy. She is using Aura Brushing, and Chakra Balancing to shield and heal herself. She practices couple of Meditations like Eknath Easwaran’s Passage Meditation, Praveen Rishi’s Ashtamangal Meditation, Mantra Meditation, Gratitude Meditation, Forgiveness Meditation, Crystal Meditation and Chakra Meditation. She lives in Chennai, India. Vidyaa can be reached via mail on vidyaa.btalreja@gmail.com.